I managed another running milestone today. After dealing with the Achilles issue, weak stabilizer muscles and the development of a particularly nasty (well, for me) case of shin splints on the opposite leg, I never thought I’d get close to my goal of 10K. I have to thank a friend of mine – he runs marathons, so I believe his advice wholeheartedly. I complained about my shins hurting during a run about a week ago and he told me that if I had warmed up the legs longer, the soreness would likely develop into a dull ache if I kept running. After 3-4km, I had to stop early. I thought he was crazy. Run more on sore legs? Really? Well, turns out he was right. On the next run, I slowed down a bit made myself run through the soreness. Let me be clear, it wasn’t pain. It was just sore. To my surprise, the soreness did indeed develop into a dull ache and nothing more. I also stretched the calves and the shins a lot after that run. And by a lot, I mean, for at least a half an hour, so much so that the next day my hamstrings were feeling it. I have to say, I was pretty stoked about the whole thing. Over the course of the next few days, the shin splint settled down. I didn’t feel it every time I walked down the stairs. I planned my long run. I can’t lie. After the first 3 minutes of running, the soreness came back. I kept going. I ran in 10:1 intervals, had to stop a few times at traffic lights and stretched the legs whenever I could. My route had a few hills. I worked hard. About half way, I thought I might throw up; that was something new. I listened to my body and slowed my pace down. I got some energy back and ran for home. 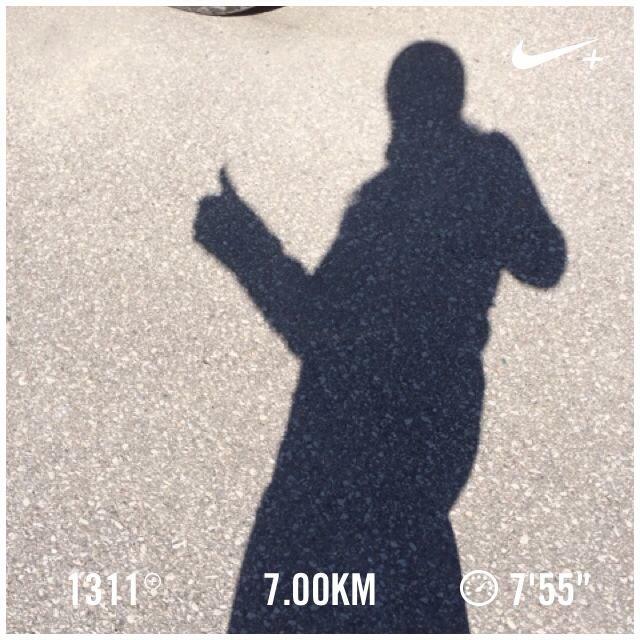 7km! And the shin feels good. Not 100% but definitely on the mend.